We love Facebook and use it several times a day! We've even been know to play Farmville from time-to-time. What we've noticed is that our updates & posts that have an image get more comments and "likes" from friends! We had an idea, how about some really cool emoticons to add a bit of color and better express "What's on your mind?". There are 114 different emoticons in Emoti. See them all here. More will be added soon! Emoti will check for them each time you use it. 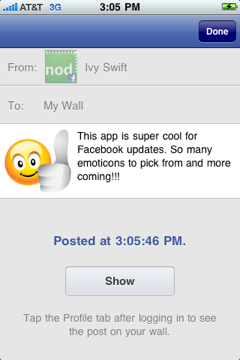 Email us to request new or custom emoticons! You don't just have to post on your Wall, you can post directly to a Friends Wall, Page, Fan Page or Group. Great if you want to send them a virtual birthday gift! Emoti has search built right in! There are over 400M Facebook users. They spend over 6 Billion minutes a day on Facebook. That's over 12,000 YEARS per DAY! Emoti will help you stand out in the crowd. © 2010 nodconcept, LLC. All rights reserved.